Organic flax oil (seed), fish oil (sardine, anchovy), borage oil (seed), extra virgin olive oil (fruit), gelatin (softgel), glycerin, purified water, natural lime flavor. Recommendations: Take 3 softgels daily. 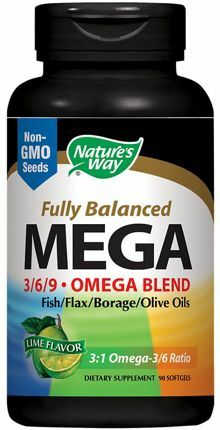 Nature's Way EFAGold MEGA is a comprehensive blend of essential fatty acids from fish, flax, borage, and olive oils from non-GMO seeds and molecularly distilled/ PCB free fish oil. MEGA contains the following healthy fatty acids: ALA, EPA, DHA, GLA and OA.